The Electoral Commission of Ghana put the said controversial final result of the 07/08 December 2012 presidential elections in which the then incumbent president- John Dramani Mahama; and the main opposition leader- Nana Addo-Dankwa Akufo-Addo, were the forerunners, as follows: [a] John Dramani Mahama 5, 574, 761 (50.70%) and [c]. Nana Addo Dankwa Akufo-Addo 5, 248, 898 (47.74%) The overall electoral showings of the minor political parties, as announced by the Electoral Commissioner Dr. Kwadwo Afari-Gyan, on 09 December 2012, amounted to 171,603 valid votes- representing 1.56%. This is captured in detailed by the Electoral Commission as follows: [b] Dr. Henry Herbert Lartey 38, 223 (0.35%); [d] Dr. Papa Kwesi Nduom 64, 362 (0.59%); [e.] Akwasi Addai Odike 8, 877 (0.08%); [f] Hassan Ayariga 24, 617 (0.22%); [g] Dr. Michael Abu Sakara Forster 20, 323 (0.18%) and last but not the least [h] Jacob Osei Yeboah 15, 201 (0.14%). If all variables/factors remain on 07 December 2016, then the contesting margin of valid votes at stake (+-) or separating the sitting-president- John Dramani Mahama (NDC) and his main political arch-rival- Nana Addo Danakwa Akufo-Addo, of the NPP, equals 325,863 (2.96%). 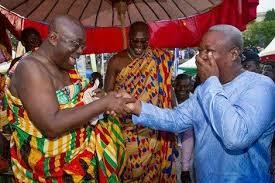 Both leaders of the NDC and the NPP, had secured five(5) million valid votes, behind them.